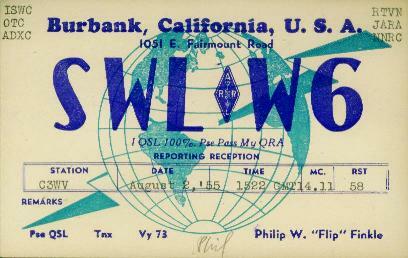 Featuring classic SWBC QSLs from the 1930s-1950s! 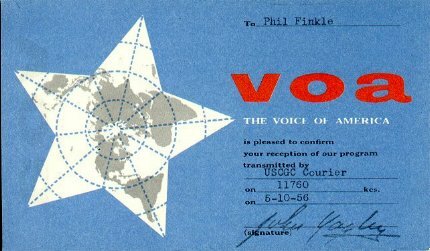 This site has images of numerous QSL cards from short wave stations that were popular in the 1930s to 1950s. Many of the countries represented no longer exist as the political entity they were forty to sixty years ago. I hope you enjoy reliving a bit of radio history as represented by this collection of antique verifications! This website is hosted by Phil Finkle (K6EID) of Marietta, GA. I was a member of the ISWL, JSWC, NNRC, ADXC, and URDXC. My first receiver was a Silvertone floor model which was moved from our living room in 1953 when we got our first TV set. After this, I had an old Zenith table radio which was of WWII vintage. 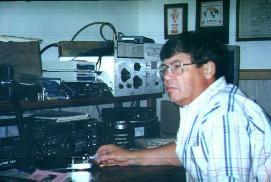 My first real communications received was a Hallicrafters S-40B that I bought on time from a Burbank CA auto repair place that had taken it in on trade. I paid for it with earnings from my paper route. My next receiver was a Hallicrafters SX-71 which served me for many years. Later I bought the epitome of receivers, a Collins 51J4 which I still have. I was editor of the West Coast Section of the URDXC bulletin in 1956. Thanks to Mike Christie, K4MZ, of Crawfordville , FL , for sending in his QSLs from some of the rare SWBC stations of this 1950s! Mike passed away in 2003, May God grant him eternal rest. Also many thanks to Richard Jary of Australia who sent us images of QSLs gathered by Wal Durbin, Willoughby, NSW in the 1930s! FIJI (BRITISH COLONY) - VPD Amalgamated Wireless Ltd.
USA - W3XAU Philadelphia, Penn. USA - W2XAF Schenectady, N. Y. 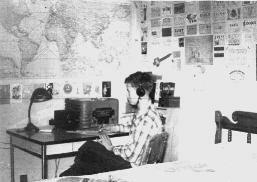 If you have any vintage SWBC QSLs that you would like to share with others, please forward a graphical format file, preferably in .JPG format, to the e-mail address provided below. Thanks! Thanks for visiting and please drop by again!